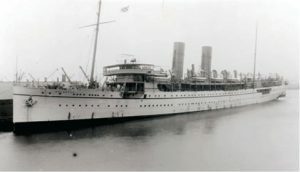 Probably the best wreck in the bay, the P&O liner Salsette was torpedoed by UB40 on 20 July 1917. The Salsette once held the Blue Riband for the fastest crossing of the Atlantic. The wreck is huge, 134m long, 34m to the starboard railing and 44m to the seabed. On the upper deck, the 4.7in gun is still attached to its mount, one of the few structures left on the main deck where the superstructure and cabins have collapsed to the seabed. There is a collapsed mast on the deck though which lies to port where a crane is visible below it. There are many large holes, which allow wreck penetration, despite containing much debris. Forward of the engine room is a large winch in middle of the wreck. The port propeller is reported to still remain at the stern, below the keel where a tidal scour gives a depth of 48m.